The bamboula and other African dances were performed at Congo Square on Sunday afternoons. Anglo-Protestant newcomers to New Orleans were both fascinated and appalled by the scene. 1. The strong presence of people of Kongo descent most likely influenced Congo Square’s name. 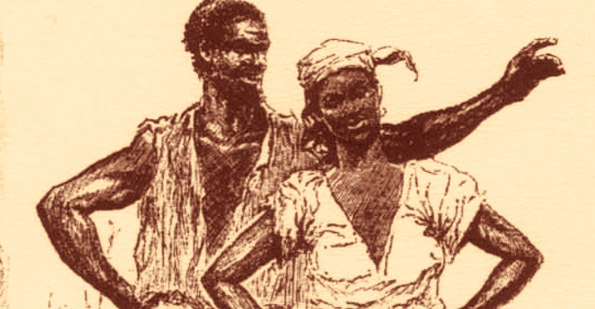 In the latter half of the nineteenth century, writer George Washington Cable theorized that the term Congo, labeling both the square and the dance, came from people of Kongo-Angola origin, who had represented the largest percentage of Africans in New Orleans since 1820. Around the 1850s, Circus Square became another popular name for the gathering place, due to Signore Gaetano’s Congo Circus. The circus was a popular part of New Orleans leisure and featured a carousel, tricks on horses, and a monkey handler. 2. Smugglers and revolutionaries brought an even greater African influence to the square. An 1808 US constitutional ban was placed on the importation of enslaved people from Africa, but smugglers still kidnapped and snuck them into Louisiana territory. The increasing amount of Africans in New Orleans brought an influx of music, language and practices to Congo Square. From 1809 to 1810, about nine thousand new immigrants entered Louisiana following the Saint-Domingue Revolution and the establishment of the Republic of Haiti. These immigrants, many of whom were enslaved and free people of African descent, helped to boost cultural practices in the square as well. 3. Congo Square acted as a place of African worship, leading to the evolution and commercialization of Voodoo. Historian Robert Farris Thompson studied the fashions of animal tails and dangling objects that people wore when congregating at the square. He realized that these objects represent nkisi, which is an object that contains spiritual properties of healing. These traditions and others melded with Catholicism to form Voodoo as we recognize it. By the end of the nineteenth century, Voodoo was commercialized to gain tourist revenue, with ceremonies being advertised as public events, and nkisi being manufactured en masse. 4. The habanera rhythm developed in Congo Square and is an essential component of jazz. The African-derived rhythm called the habanera was embodied in many of the songs and dances performed in Congo Square. It’s a lively, three-beat rhythm that can be heard in songs such as “Quan Patate-Lachuite”. Congo Square is oftentimes referred to as the birthplace of jazz, with pianist Jelly Roll Morton declaring that the habanera must be present in order for music to be labeled as jazz. He often referred to it as the “Spanish tinge”, and the rhythm of the habanera was adapted into the second-line beat. 5. Congo Square functioned as a spot of economic gain for enslaved people. In 1817, a city ordinance restricted enslaved people to a single gathering place, Congo Square. On Sundays, they would gather there to sing, dance, worship, buy, and sell goods. Women would walk around selling baskets of freshly made “calas,” which were deep fried rice cakes covered in powdered sugar. These cakes originated in Liberia and closely resemble the beignet. Calas cakes are made of a rice base, giving them a certain moisture and density that beignets lack, leading to the claim that calas taste much better. 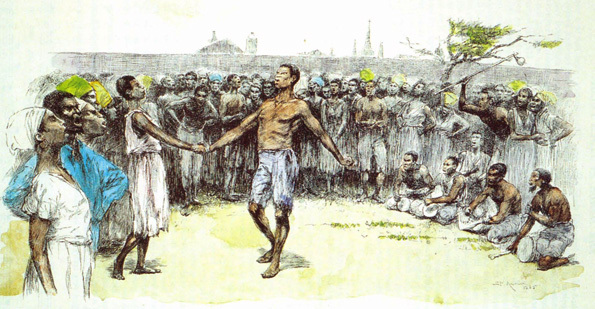 Unlike the rest of the South, slaves in New Orleans were permitted to gather on Sundays and holidays in Congo Square to trade, socialize, and perform their traditional African dances.